Last week in Part 1 we looked at some of the decisions that need to be made before building a large home workshop. As I described, I have chosen a 14 metre by 6 metre wide Colourbond shed with 3 metre high walls. Here are the first stages in how it was built. The first step was to gain planning approval. In fact, I didn’t get approval before starting the shed purchase and earthworks, but I talked extensively to the local council until I had a very clear idea of what would and would not be permitted. While this sounds backwards, planning approval cannot be gained until you have the shed plans in your hands; you can’t have those until you’ve effectively bought the shed! 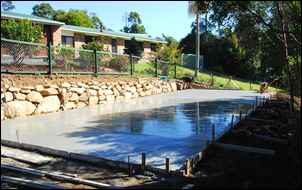 Ditto with the concrete slab, which in the case of my workshop, needed additional engineering over the standard slab plans provided by the shed manufacturer. To be honest, I found the whole process complex and confusing. For example, one council requirement was a contour plan of the block - this would have required engaging a surveyor and would no doubt have cost a helluva lot. However, when I talked directly with the council planners who would be evaluating the proposal, they said they just needed a simple sketch. Under the current local planning legislation, the size of shed (84 square metres) is not permitted on the size of my block (1105 square metres). However – and again very confusingly – under a superseded (but still able to be used!) planning act, the shed could be passed. As I said, before you even start to consider building options, really good oral communication with the appropriate planning authority is highly advisable. The council fees were AUD$650. The shape of my block is rather strange, and so despite the workshop being built in front of the house, it is actually placed more in a side yard than a front yard. 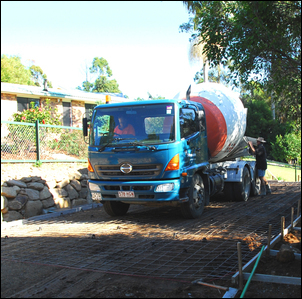 However, new front access still needed to be provided so that not only could car access to the workshop be eased, but also so that a concrete truck could easily reverse up to the shed site. 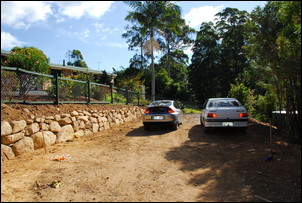 A local contactor was employed to double the width of the existing driveway. 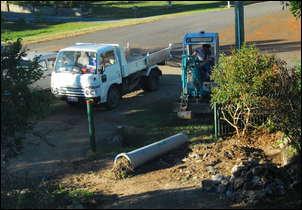 This required the laying of a 2.5 metre, 30 cm diameter concrete pipe for stormwater run-off along the edge of the road, and then placing compacted earth on top. I only realised late in the timeframe that this work would need to be done: it would have been far cheaper if it had been completed at the same time as the shed site earthworks described below. Quotes varied from AUD$980 to $660 – I knocked down the lower quote to $600 neat. Extensive earthworks were needed. 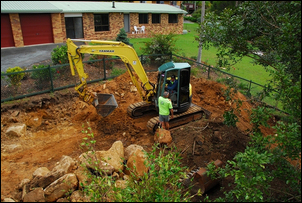 Not only did the area need to be cut and filled, a pad needed to be created for a new rainwater tank, a large tree stump removed and two rock retaining walls built. 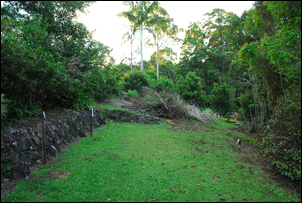 One, along the upper side of the slope, comprised a 20 metre, ~1 metre high rock wall, while the lower one was shorter in length. Interestingly, during excavation of the site, a large number of boulders were dug up – these were used (with additional rocks) in the retaining walls, so not increasing the overall earthworks/wall building price despite the fact that more retaining wall was needed than was included in the original quote. The one company did both the walls and the earthworks. The bill was $4,422. There is no recommended minimum time between the completion of the earthworks and the pouring of the concrete slab, however I decided to wait as long as possible to allow the soil to settle. That amounted to about 10 weeks. The concrete slab was a tricky one. Because the slab was to be half on ‘fill’ and half on excavated ground, it needed piers to support the section of slab positioned on the fill. These ‘poured’ piers needed to extend down to the level of the natural ground. A poured L-shaped and reinforced concrete beam was also used to join these piers. 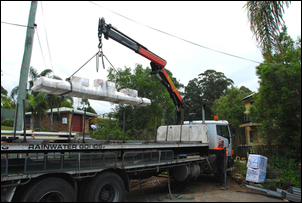 As you’d expect, the cost was therefore a lot greater than for a conventional slab – it added up to AUD$6500. Reinforcing mesh was used across the full area of the slab, with extra sections used in the beam joining the pillars. The slab was 100mm thick, while the beam was shown on the plans at 300mm x 300mm but actually ended up more like 500mm x 300mm. The pillars were about 300mm in diameter and varied in depth from 300 to 800mm, depending on their individual requirements. A ‘step’ was placed in the floor at the entrance to the shed. This prevents wind-borne water being blown under the roller doors and into the shed. Note that the location and height of this step needs to be organised in conjunction with the shed suppliers – different shed designs will have different requirements. 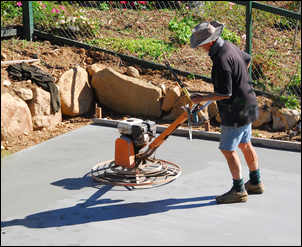 While the concreting was being done, the boss suggested to me that they might have some concrete left over – and if they did, would I like a short apron placed in front of the shed? I did – and it turned out to be 1.5 metres x the full width of the shed! That’s 9 square metres of concrete that: (1) didn’t cost me anything at all and, (2) will be able to provide a hard stand for a car partly backed out of the shed, or items stored on it. The other aspect of the concreting that impressed me greatly was the use during the pour of a laser level, allowing the surface to be made as flat and level as humanly possible. 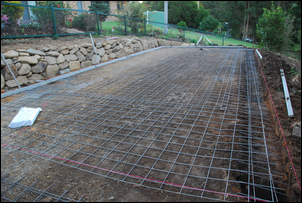 I’d stressed before the work started that I wanted a dead-flat and level floor – and told the concreters the reason why: I want at some stage to build a car in this shed, and the starting point needs to be a near-perfect datum. The chosen surface finish of the floor was smooth; this was achieved with a power-driven rotary trowel (“helicopter”). An alternative finish – one that was used on the apron - was a ‘broomed’ texture, achieved by literally pulling a broom across the surface when the concrete was yet to harden. The final stage in the slab was to saw expansion gaps across the slab, one cut across the shed at each of the shed uprights and one longitudinal cut the full length of the shed and apron. This cutting was made 48 hours after the pour. For reasons relating to an imminent price rise, the shed materials were bought and delivered before the slab was complete. 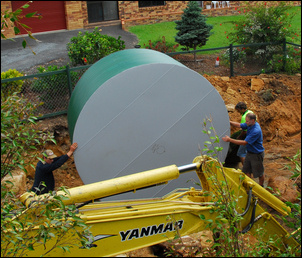 As a result, the materials were deposited in my driveway, rather than at the shed site itself. At least two weeks is recommended between the pouring of the slab and the errection of the shed. After a week or so I made enquiries at the shed supplier as to when the shed could be erected. I was disconcerted to find that it would be at least 6-8 weeks before they could put it up – and that I should add an extra day to that waiting period for each day it rained in the district! This delay was likely to cause me a series of problems. The first was that in my job working for AutoSpeed, I build-up a buffer of articles so that every now and again I can embrace a more major project that I can then write about in AutoSpeed. At the time all this was happening, I’d built up the article buffer – but now the shed wouldn’t be ready to let me do any of those projects! The second problem also related to my job at AutoSpeed – the series that you’re now reading required that the shed be completed within a certain time frame, and with an 8+ week delay, that wasn’t going to occur. Third, because I’d been preparing for a major workshop relocation, I’d started packing up my old under-house workshop. Without the shed being built, both workshops were unusable – again, because of my job, putting me into a difficult situation. And finally, I guess having seen the earthworks done, the slab poured, and the shed materials delivered – I now didn’t want to hang around 2 months waiting for something to happen! I rang the shed supplier, asking if I could organise erection of the shed by another party. (A contract had been signed that the shed would be erected by the supplier – now I was trying to get out of this.) Much to my surprise, they supplier immediately agreed – and furthermore, said they’d be happy to make available the instruction kit for building the shed. Next week, a shed novice singlehandedly starts to build a 14 x 6 x 3 metre shed. Go here for the next in this series. Interested in home workshop projects and techniques? 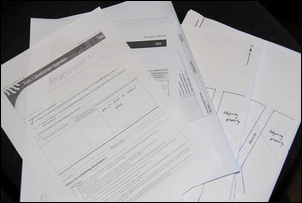 You’re sure then to be interested in the Home Workshop Sourcebook, available now. Is it worthwhile tuning an engine cylinder by cylinder?